Born to the patrician Tulane family of French immigrants in Princeton, Paul Tulane led a privileged life as a young child. Educated in private schools, working for family businesses, and touring the southern United States, Tulane developed an intense appreciation for business, philanthropy, and the towns of Princeton and New Orleans. The next years of Tulane’s life were dedicated to building Tulane & Co., one of the largest and most prolific traders in dry goods and retail in New Orleans in the first half of the 19th century. He was an incredibly secretive and suspicious man, so not much is known about large portions of his life. Tulane retired from work in 1857 back to the town of his birth to continue his philanthropic efforts. His list of benefactors included Presbyterian churches all over New Jersey and Louisiana, schools throughout New Orleans, even the Confederate States of America during the Civil War. He never married, nor did he have children. Near the end of his life, he donated over $300,000 (a huge sum at the time) to the University of Louisiana, transforming the institution from a public school into a private university that bears his name today. While Tulane never attended Princeton or the university that now bears his name, Tulane was a native of the town and never forgot about it. 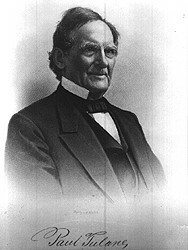 After earning his fortune in dry goods in New Orleans, Tulane returned north to Princeton in 1857 to focus on his philanthropy full-time. Among the many recipients of his donations include Presbyterian churches in Princeton and New Orleans, as well as secondary schools and higher-learning institutions. But perhaps most famous of all is an oft-told urban legend about Tulane and his donations to Princeton University. Legends abound surrounding Tulane’s supposed ego. One story has it that Tulane had originally planned to give over $300,000 to Princeton, on condition that the name then be changed to “Tulane University”. When Princeton refused, Tulane took his money to the future Tulane University, and demanded he be buried with his back to Nassau Hall. In terms of actual historiography, there’s no real evidence to support this tale. What actually happened is somewhat more plausible. His donation to Louisiana University was not intended to change the name of the school, and when they approached him, his initial reaction was “no”, the opposite reaction one expects from the ego driven person the legend suggests. But it is worth mentioning that Tulane’s grave does face away from Nassau Hall, something both Princeton and Tulane grads find evidence enough to keep the story alive. At the same time, this is the same direction as his ancestral home, so for now, this legend remains a tall tale.